Psst - The ENERGYbits giveaway is closed. Check to see if you won here! I'm blogging from the car somewhere between Oklahoma City and Amarillo right now while it's the bf's turn to drive. Modern technology is amazing! Even though I'm trying to stay healthy by prepping nutritious snacks and fitting in workouts when I can, I'm still eating a lot of awesome road trip food. I mean come on, when else will I have the chance to eat my way through almost 2,000 miles of awesome local cuisine? So in the spirit of keeping it real, here's some of the delicious and decidedly unhealthy food I've eaten on the road from Arlington, VA to Oklahoma City, Ok for this week's What I Ate Wednesday. We got a late start on Monday and almost didn't make it to Athens Family Restaurant. Luckily, we forgot about the 1 hour time difference between Arlington and Nashville and just made it 30 minutes before closing at 10 pm. 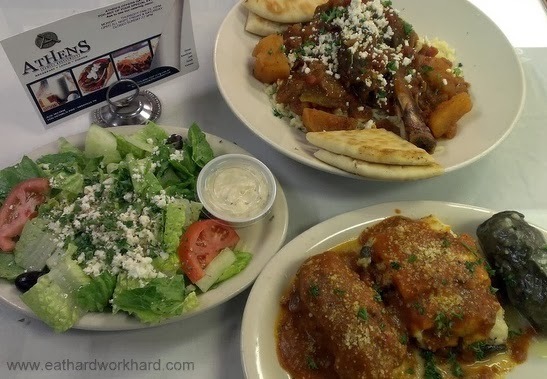 Featured on Diner's, Drive-Ins and Dives, the Greek restaurant was everything I expect from a DDD selection: awesome food and generous portions but easy on the wallet. We got the lamb shank special and that day's combo platter with suzukakia, mousaka and dolmades. The lamb shank was tender amazingly melty, though and the dolmades (stuffed grape leaves) were the best I've ever had. Surprisingly, the suzukakia, a giant Greek style baked meatball with tomato sauce featured on the show, was our least favorite item. With 10 hours of driving on Tuesday, I was planning to just grab a salad to eat on the road for lunch. But when the bf saw we were passing through Memphis he insisted on stopping for barbecue and I'm glad he won that argument (for once). Family owned and operated since 1977, Cozy Corner is well known as THE place to go in a city famous for its barbecue joints and has been featured on DDDs, Bon Appetit and 1000 Places to See Before You Die. We got the barbecued WHOLE Cornish hen (!) and two bone in ribs. 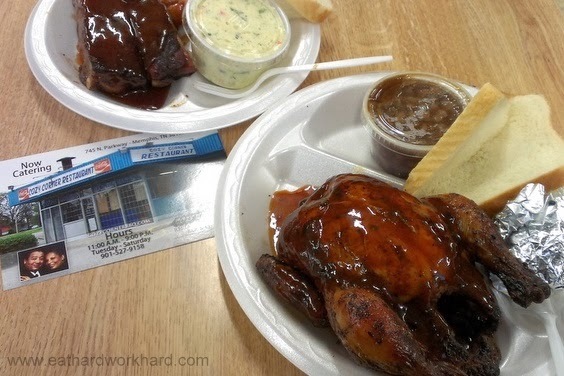 Crispy skinned on the outside, super moist on the inside and smothered in delicious tangy sauce, the Cornish hen was the best barbecued chicken I've ever had, The ribs were also tasty, flavorful and tender but not mushy. The only disappointment was that they were out of the barbecue spaghetti, pasta smothered in barbecue sauce. Probably a good thing with the amount of food we had. With our 10 hour drive and lunch stop, we got to OKC after 9 pm and searched Yelp for good late night dinner options. A chain restaurant located alongside a shopping complex a little outside downtown, I didn't have super high expectations for Whiskey Cake. But it did have four stars on Yelp and specialized in farm-to-table food so we gave it a shot. Boy were we pleasantly surprised! We shared the fried green tomatoes and signature whiskey cake. 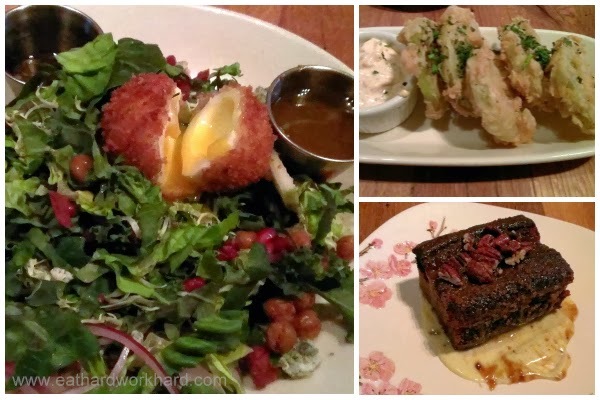 For entrees, I had the kale and pomegranate salad and the bf had a crazy big burger which I didn't get a picture of. Everything featured super fresh and high quality ingredients. Sounds like an awesome road trip so far! I think no matter where we are, my boyfriend has a craving for BBQ! That's a funny picture of John Snow talking on a cellphone. Anywho, I ate a delicious catfish stew my hubby made last night. I'm jealous of your rode trip and foodie tour. You only live once so that was good you tried the local fare. You can always work it off later. Hey, thanks for stopping by WOW and stop by The Frugal Exerciser when you get a chance. I'm totally jealous of your eats and DDD stops along the way!! Everything looks really yummy! Keep enjoying the stops along the road. Safe trip! It's definitely necessary to branch out into less-than-healthy food from time to time. Otherwise what is the rest of it for, if you can't sometimes treat yourself? ;) Looks like you're having a great trip. And now I want to batter a poached egg!